Summer gives us time to look back and reflect on the hockey season. It gives us time to remember years gone by. It's time to go back and remember some of the most memorable moments in team history. This week we travel back to 2016. It seemed like a lost year. Barely in the playoffs the year before, a big trade with Phil Kessel added and the Penguins couldn't score. Marc-Andre Fleury was the only thing keeping them alive with everyone, even Sidney Crosby, struggling to produce under Mike Johnston. In December everything changed. Johnston was sent packing and Mike Sullivan was promoted. Rob Scuderi was shipped out of town for Trevor Daley. And after four games the Penguins went on a tear. A tear that just never, ever seemed to end. Adding Carl Hagelin for the low price of seemed to complete a team that looked to have a date with destiny. Surviving injuries to their top two goaltenders, with Mr. Game One Jeff Zakoff cementing his legacy in Pittsburgh, the Penguins went through the New York Rangers. 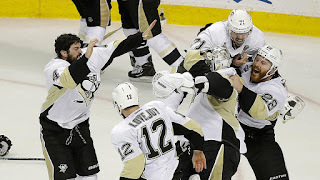 The next round they fought off the President's Trophy winning Washington Capitals. After that a seven game battle with the Tampa Bay Lightning. From there it was off to San Jose. Two wins in Pittsburgh. One win in San Jose. Unable to close the deal at home they went back to the Bay for Game 6. And there Crosby, Malkin, and more etched their names on the list of multiple Cup winners. A second Stanley Cup cemented Malkin and Crosby's legacy as all time greats. It seemed surreal, the way it all just came together so perfectly. And yet it felt like more was to come.